Senior guard Zack Panebianco pushes the ball up the court in the team’s game against SUNY Oneonta. Panebianco scored 23 points off the bench in the team’s 89-77 loss to the Red Dragons on Friday Feb. 1 (Udeshi Seneviratne/Photo Editor). The Geneseo men’s basketball team was back in action this past week. The team went 1-2 with losses to Buffalo State and SUNY Oneonta as well as a victory against SUNY New Paltz. 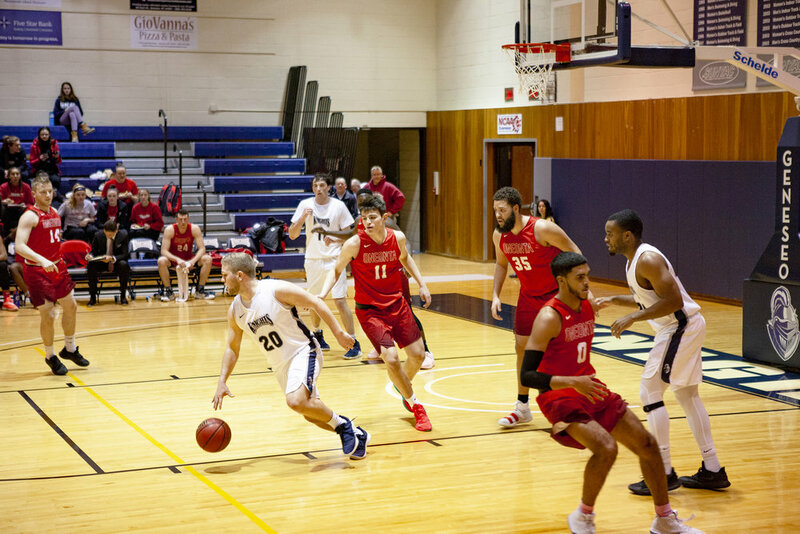 To start the week, the Knights played Oneonta at home on Friday Feb. 1, senior guard Zach Panebianco lead the Knight’s offense with 23 points and went 11 for 11 at the foul line. His efforts, however, were not enough as the Knights fell by a score of 89-77. Junior guard Terence Rogers weighed in on what went wrong for the Knights. Taking care of business is exactly what the Knights did the next day at home against SUNY New Paltz. Junior guard Terrance Nichols led the way and scored 23 points while sophomore forward Alex Merhige scored an extra 13 points and recorded a 10-rebound double-double in the Knights 62-58 victory. Nichols was thrilled with how the team played and how they gained their much sought-after win. Moving on to Tuesday Feb. 5, the Knights traveled to Buffalo State for their second and final matchup this season. Just a week earlier, the Knights lost to the Bengals 91-69. Before the game, the team laid out a plan for what they wanted to accomplish. Rogers had more modest ambitions for the game against Buffalo State. The Knights fell short in Buffalo, losing by a score of 81-73. Both Panebianco and Nichols had stellar games, netting 26 points and 23 points respectively. It was the first time since Feb. 3 2018 that two separate Knights netted at least 20 points. Senior forward Jack Manke lead the Knights in rebounds with seven in total. Up next, the Knights will host SUNY Brockport on Saturday Feb. 9 before travelling to Brockport on Tuesday Feb. 12 for their final regular season away game. Rogers shared the game plan for the next two games against Brockport. With only four games left on the schedule and currently sitting ninth in the SUNYAC, the Knights must win out and get a bit of help if they want to slide in to the sixth and final playoff spot. The final playoff push starts Saturday here at home against Brockport.